OLIVIER ZAHM — Your recent exhibition with Gladstone Gallery is called “DE-PIXELATION.” What do you mean by that? THOMAS HIRSCHHORN — It comes from the decision to see and look at the world as it is, and to insist on doing so. I believe that pixelation, blurring, or masking — and furthermore, censorship or self-censorship — are growing and insidious issues, also in social media today. I don’t accept that under the claim of “protecting” — protecting me, protecting the other — the world is pixelated in my place. I want, I can, I need, and I must use my own eyes. Today, more than ever, I need to see everything in the world with my own eyes, and no one can tell me what my eyes should see or not. THOMAS HIRSCHHORN — “De-pixelation” is the term I use to say that pixels can no longer conceal fake news, news, facts, opinions, or comments. We have definitely entered the post-truth world. Pixelation stands for the form of agreement in this post-truth world. To agree means to face reality, to struggle with it, to confront it, to challenge it. To agree means to open the eyes, to be aware, and to pay attention. To agree does not mean to approve! But I must — as an artist who wants to give form — agree with the world I am living in. To do a work of art, today, is only possible in contact with complexity, reality, incommensurability, the time I am living in, and the world I am part of. Today, more than ever, no one can tell me what is of importance or not of importance to me, what it is to see and what it is not to see for me. “De-pixelation” is dynamic, a movement, an action; “de-pixelation” is not static, fixed, or frozen. OLIVIER ZAHM — What would this world look like? THOMAS HIRSCHHORN — Beautiful. Beautiful because it will be the one world, the unique world, the only world, the common world. OLIVIER ZAHM — What do you think this new digital censorship is actually controlling, under the guise of protecting us? THOMAS HIRSCHHORN — Former US Defense Secretary Donald Rumsfeld said, “Death has a tendency to encourage a depressing view of war.” This quote shows us how censorship — under the claim of protection — wants to neutralize my awareness, my attention, my sensitivity. Here, it is necessary to distinguish “sensitivity,” which to me means being aware and attentive, from “hypersensitivity,” which means self-protection, self-enclosure, and exclusion. I need to confront reality without “hypersensitivity,” without distancing, without self-protection. Today, the aim of censorship, the aim of control, the aim of the algorithms is to own every possible piece of data about each of us, in order to make us better consumers and less resistant to consumption. OLIVIER ZAHM — Is it possible to look at the world as it is? THOMAS HIRSCHHORN — It is an absolute necessity, and it’s the mission of art. Nothing is unshowable, nothing is not to be seen. The only thing that cannot be shown is what has no form. Usually pixels stand for “the worst is concealed.” It means that by pixelating a picture or a part of a picture, there are commensurable and incommensurable parts of the picture pointed out. But to me, nothing is commensurable or non-commensurable, and no one can make a choice about what should be commensurable or not to me. Everything is important. OLIVIER ZAHM — In what sense have we entered a post-truth world? OLIVIER ZAHM — Shouldn’t we still fight for the truth? THOMAS HIRSCHHORN — It is necessary to make a difference between “the truth” and truth. I am interested in truth. I am interested in art as truth. On the contrary, “the truth” as the verification of a fact does not interest me. Art does affirm truth. truth; something “right” can be only a verified fact. Belief in truth as such is something essential. Therefore, I place truth at the same level as universality, equality, and justice. OLIVIER ZAHM — How do you redefine your idea of abstraction today? 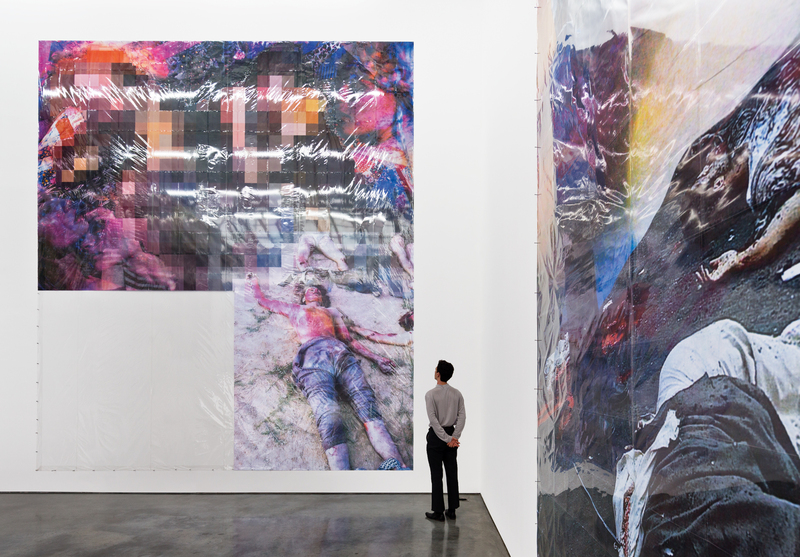 THOMAS HIRSCHHORN — I am interested in pixelation because its logic leads to abstraction as a paradox. In and with my work Pixel-Collage, I want to give a response, through form, to the question: how can abstraction be understood today? How can abstraction, through pixelation, engage me in today’s world, time, and reality? I think pixels — in their abstraction — build up a new form, opening toward a strong dynamic and a desire for truth. I understand abstraction as thinking, as political thinking. The point is to understand how an existing published picture can become an abstraction. It seems to me that — paradoxically — the authoritarian will to use pixelation in order to hide, to “protect,” not show, or not make something visible has, instead, become an invitation or possibility to touch truth. Truth through pixels, through their abstraction and the aesthetic of their abstraction. 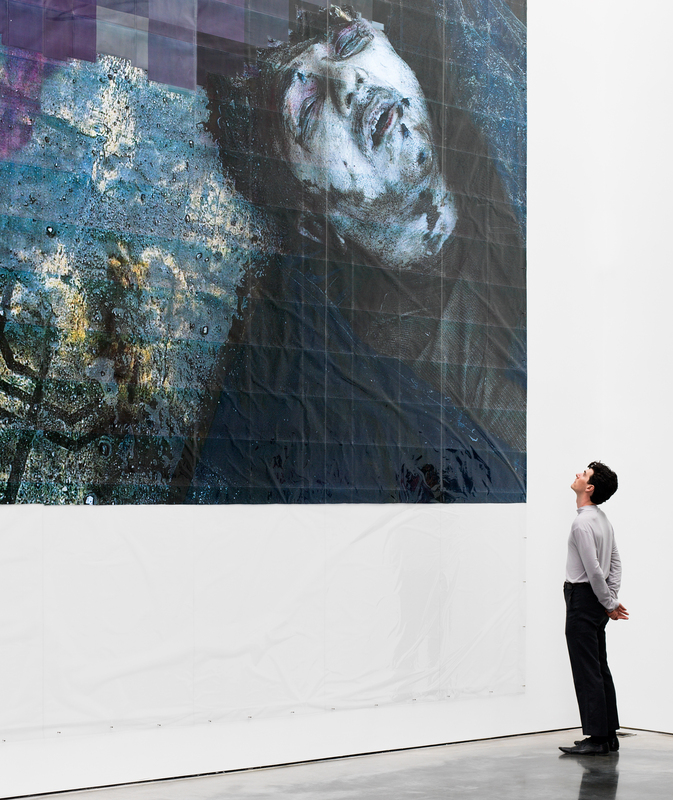 OLIVIER ZAHM — Do you search for a certain aesthetic when you pixelize a journalistic picture of a terrorist attack? Or do you use pixelization to play with and even accentuate the authenticity and the horrifying violence of the image? and more common in the media, shows us that, in order to be authentic, a picture needs to be pixelated or partly pixelated. Pixelating has taken over the role of authenticity. A pixelated picture is surely authentic if it has unacceptable areas that are concealed, while the acceptable is not pixelated. It is interesting to observe that the use of pixels follows no common law at all. Partly pixelated pictures look even more authentic and are accepted as such by viewers. It therefore seems clear that pixels stand for authentication: authentication through authority. Paradoxically, pixels add an aesthetic to the politics of protection. OLIVIER ZAHM — Is art still a grand gesture of emancipation? THOMAS HIRSCHHORN — Yes. It’s the one, at least to me. I am doing art because I love making it. I love working in an enthusiastic and self-inventing dynamic. Making art is a headless manifestation of love — love as a movement, a con­viction, and a passion. This love is not selfish, narcissistic, or self-satisfying, but is my mode of emancipation. Art makes me stand up, makes me use my physical and intellectual ability, and apply my tenacity. Thanks to art, I must — and can — confront my very own reality to the surrounding reality. Making artwork makes sense, and I understand it as a mission to accomplish — beyond success or failure. Doing artwork is not an escape or a dream. If my work is intense, charged, and dense, it has a chance of making a breakthrough, a breach in today’s dilemma, problematic, cul-de-sac, and no-exit, and in the deadlock of resignation and cynicism. Therefore, art is an emancipatory act and, as such, a necessity to me. OLIVIER ZAHM — When you say, “Form is not just an idea — form is the core,” what do you mean? Is form a tool or a weapon for you? THOMAS HIRSCHHORN — To give form is essential. I think form is the most important question in art. It is essential because it questions: how can I take a position? How can I give this position a form? And how can this form create a truth, a universal truth? The problem is to give a form, my own form, something belonging to me only, something only I see and understand as such, and something only I can give. I want to do an artwork in exaggeration and preciseness, a work that, in its charge and density, stands for a new form. To give form is decisive. I use the term “giving form” because it means “giving from myself.” Giving form is not making a form or “doing” a form. Therefore, I invented my form and force-field. They include the notions of love, philosophy, aesthetics, and politics. I always want to embrace these four notions in and within my work, and also with the Pixel-Collage. Therefore, aesthetics is only a part of form, as are philosophy, politics, and love. The core is, was always, and will be forever: form. OLIVIER ZAHM — How can we confront, without fear, the world today: its chaos, its violence, its loss of rationality, and its tendency toward the apocalyptic?